Does anyone else read recipe books in bed? I do. On weekend mornings with a cup of tea. This flourless chocolate cake was meant to be rich chocolate cake from Peyton & Byrne's brilliant British Baking book but after erm... misplacing my whisk (I know), I had to adlib the whole thing. 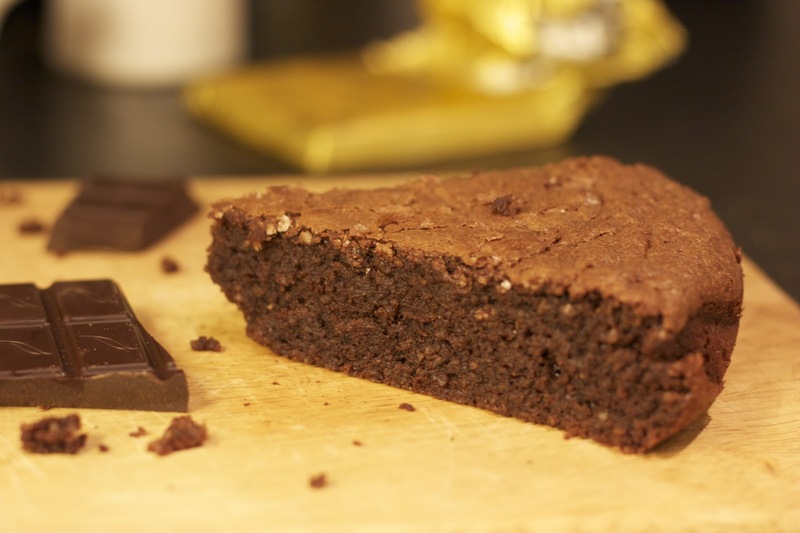 We've made a gluten free chocolate cake before - Caleigh uses chestnut flour in hers. This actually has no flour at all so clearly the only raising agent is magic and crossed fingers. Instead it calls for ground almonds (I recommend buying every single bag your supermarket has, they can be tricky to find). Care in the prep is key with this recipe - don't over mix or beat too hard, you'll get a horribly dense and heavy cake. Treat this cake carefully and you'll have rich and chocolatey gluten free magic. Preheat your oven to 160 degrees/gas mark 3, grease and line a round 23cm baking tin. Melt your chocolate in a bain marie. When it's nearly all melted, give it a bit of a stir and take off the heat. Add the butter. Leave for a few minutes while you get on with the rest of your mixing. Add the cocoa and ground almonds, carefully folding in. You only need them to be just mixed. Give your chocolate and butter mix a bit of a stir and then add it to your mixing bowl, folding gently until everything is mixed together. Pour into your cake tin and pop in the oven for about 35 minutes. Leave to cool for ten minutes in the tin and then when it's still slightly warm, pop out and eat three slices when you only planned to eat one. Hurrah! I'll have to give this a go. It wasn't what I was meant to be baking, but it's so tasty. I only took half of it into the office because I didn't really want to share. I buy my ground almonds from Aldi, cheap and they always have them!